With the news that IMO has set a target of halving shipping carbon emissions by 2050, the heat is on everyone in the chain to do more to make the process of international trade cleaner. It is inevitable that the pressure for ports to up their game in reducing emissions and energy use will also continue to intensify. Listening to the discussions at an ICHCA seminar at The Hague last week (hosted by APM Terminals) it is clear that the significant pressure on ports to become greener is not just coming from lobbyists and industry opinion formers. Influential pressure is coming from customers needing to support their own consumer propositions with a reduced carbon footprint. Massive players such as Google, Amazon and Apple are setting the agenda by influencing their whole supply chain to meet green targets. Such issues obviously have the attention of forward-looking terminal operators and this will gain further impetus when the choice of terminal starts to be based on the ability to meet this customer need. 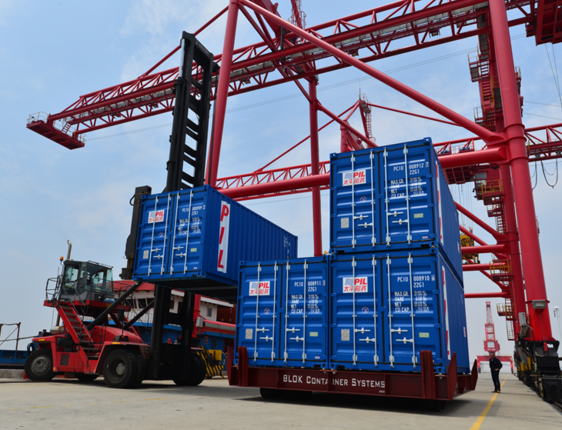 BLOK Container Systems is clearly aware of these industry drivers and has created a fundamentally more efficient, cleaner and safer method of container handling. Supermarkets have for a long time demonstrated that containers such as beer cans are much easier to handle in multipacks so the question is why are most shipping containers still handled singly? Weight is of course an issue but cranes are already generally capable of handling at least four empty containers at once which represents 20 per cent of global container moves and the strength of cranes is increasing.With spreaders and trailers designed by BLOK to cope with this, the efficiency gains are obvious with fewer vehicles and faster loading and unloading the result. As well as the direct benefit, time saved can be repurposed for slower sailing, a win for terminals, shipping lines and the planet. With many terminals looking to automation perhaps is now the time to realise the benefits of a fundamentally more efficient system rather than just automating what the industry has been doing for the past 50 years.